Maïté, 14, and Loup-Sachel, 12, who join me, as always now, in wishing you all a successful, prosperous, joyful, mindful, peaceful and loving 2012. To Enjoy or to Not Enjoy… That is the question. When it comes time for celebration, it is easy to forget all our good intentions, especially for the sake of having a good time. And probably, in the bigger picture, it is all for the better anyway. Being rigid does not help anyone either. So here are a couple of ideas to help with the excesses of this time of year. For one, when preparing food, or indulging in them, it might lighten the load on one’s body when the following are included or chosen preferentially, since they all top the list in their respective category: blueberries (berries), walnuts (nuts & seeds), dark chocolate (in the chocolate food group, and at least 70%), pomegranates (fruits), kale (vegetables), red wine (wine food group), grape (fruit juice), black, filtered (coffee food group), green tea (herbal teas) and barley (grains). Of course, focusing on chocolate and/or red wine alone might topple an otherwise carefully planned celebrative diet, so moderation and balance is the key of course. When I first encountered the text for Course in Miracles, I approached it with a mix of curiosity and deep skepticism, an emotional legacy of Catholic teachings that had left a bad taste in my mouth. I hardly opened the book before replacing it where I’d found it. That was 15 years ago while a student in Western herbalism. Now, I am deeply immersed in it, even though I indeed first had to overcome what felt like repulsive, Christian writings in order to access the deeper message contained in the daily lessons. What follows is a slightly adapted version of a recent lesson, re-rewritten to make it palatable for everyone, especially those who, like me, may at some point have harbored resentment toward established religions. The text may sound grand, yet there is likely no more powerful affirmation. Why not shoot for the stars? What Am I? – I am a Child of the Universe, complete and healed and whole, shining in the reflexion of Universal Love. In me is creation sanctified and guaranteed eternal life. In me is Love perfected, fear impossible, and joy established without opposite. I am the holy home of Universal Love itself. I am the Heaven where Universal Love resides. I am holy Sinlessness itself, for in my purity abides Universal Love. May 2012 bring positive changes to ourselves, our communities, our Earth so that we can live flourishing lives filled with the safety, beauty, and peace of Universal Love, for generations to come. Buzz Lightyears in Toy Story. You can bomb the world to pieces but you cannot bomb it to Peace. To whomever had the great idea of hanging a ‘Peace on Earth’ banner on the Hwy 19 overpass on the way out of Cumberland, thank you! I certainly wish that many more of us will have a thought for world peace among the many resolutions that are made this year. On that note, making resolutions is one thing, having the ability to keep them is another. Boy that dark chocolate bar is tempting! (Good thing research now show that 70% or more in cocoa content is good for us human beings.) World peace is a by-product of the thoughts, deeds, and prayers we personally engage in. Making resolutions is definitely an important step. And Chinese medicine, in the form of energy psychology, can help with that. Energy psychology, aka Emotional Freedom Technique (EFT), has definitely gained notoriety among therapists the world over. First used to help with simple issues like fear of heights, or snakes, or public speaking, the true success story emerged once its effectiveness was tested on US war veterans suffering from various symptoms associated with PTSD. Energy psychology and EFT are now used on just about anything. These approaches are not always successful, of course, but they have been successful at least once on just about anything. What’s more, the worst that can happen is an increase of energy flow throughout your body. And most of us can use that , even on a good day. Before we continue, here’s a couple of stats to tickle your curiosity. The data shown below mirrors my own clinical experience with this approach. What I’d like to offer today in this newsletter is a quick overview of how EFT can be used to assist you in keeping your resolutions, and therefore increase your level of personal peace, the first step to world peace, at least, as I see it. 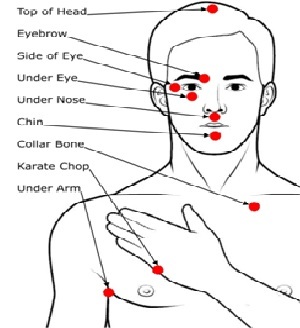 3- Do one or more rounds of tapping on all the points as shown below, beginning with the inner eyebrow and ending with the top of the head, while repeating the reason identified above, i.e. without the “even though” sentence, just the filler part. Do this as often as resistance or doubt shows up throughout the day. There are many good clips on YouTube that can guide you better in finding these points. Just search for “EFT”.